Donations made to online campaigns on Livingtree Give may be tax deductible. Generally speaking, donations made to any "legally registered non-profit (501c3) or charity may be considered eligible for donors to claim as a tax deduction"
Also generally, "any school district program that does not operate for profit and is solely supported by state and local governments" might be considered eligible for donors to claim as a tax deduction. Please consult with your accountant or tax preparer for best advice. Both receipts include full details of the donation, including name of campaign, donation date, donation $ amount, etc. 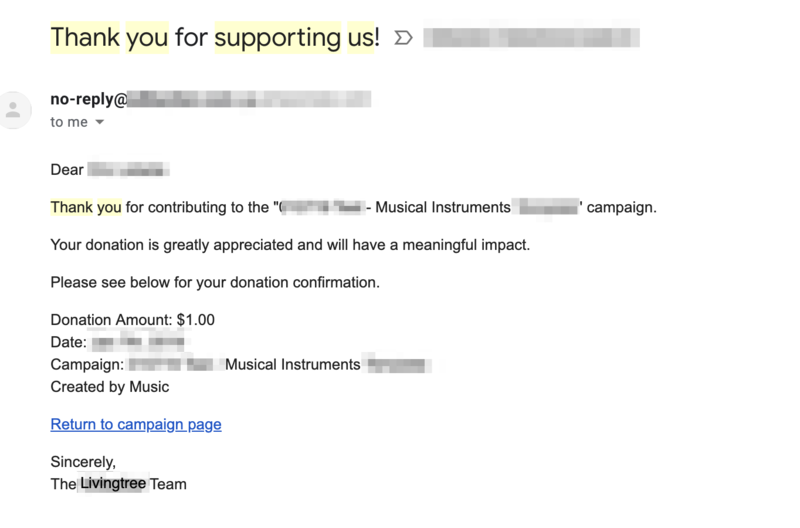 Note: The Livingtree Give receipt may include a special message written by the campaign creator (IE - to thank donors, what campaign funds are going to, etc). Either of these should be acceptable for you to use to claim as a tax deduction, if applicable.